Phone Settings See “Phone settings” in this section for more information. Connect New Device Touch to connect a new Bluetooth® device to the Bluetooth® Hands-Free Phone System. Select Connected Device Touch to choose a Bluetooth® device from a list of those devices connected to the Bluetooth® Hands-Free Phone System. Replace Connected Device Touch to replace a Bluetooth® device from a list of those devices connected to the Bluetooth® Hands-Free Phone System. 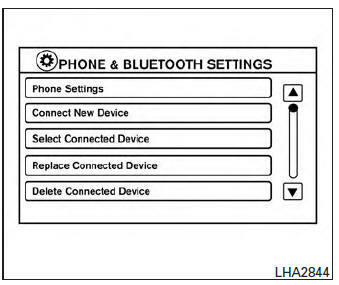 Delete Connected Device Touch to delete a Bluetooth® device from a list of those devices connected to the Bluetooth® Hands-Free Phone System. Bluetooth Touch to toggle Bluetooth® on and off.